Hubbub needed more leads from the education and charity sectors. Whilst a community amongst its audience had been established via a popular newsletter, there was a need to convert those further down the buying cycle. Hubbub is a B2B ed-tech company helping nonprofits inspire, ignite and grow cause-led movements through digital. Research: Developed a detailed understanding of precisely who the sales team wanted to speak to in order to set a target number of leads. Strategy: Prepared 3 plans: ‘pre-webinar’, ‘during webinar’ and ‘post-webinar’. Implement: Project managed the implementation of the plan. 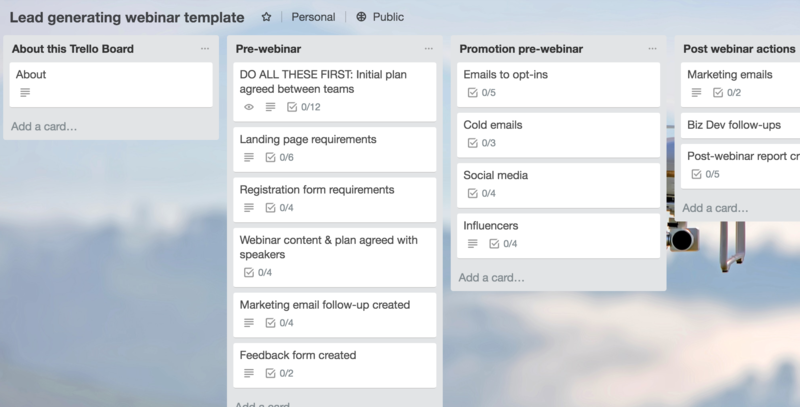 Report: Noted results and created a template to replicate the webinar process via this Trello board. A large list of qualified leads for business development to easily engage with. Quarter’s pipeline target was met. 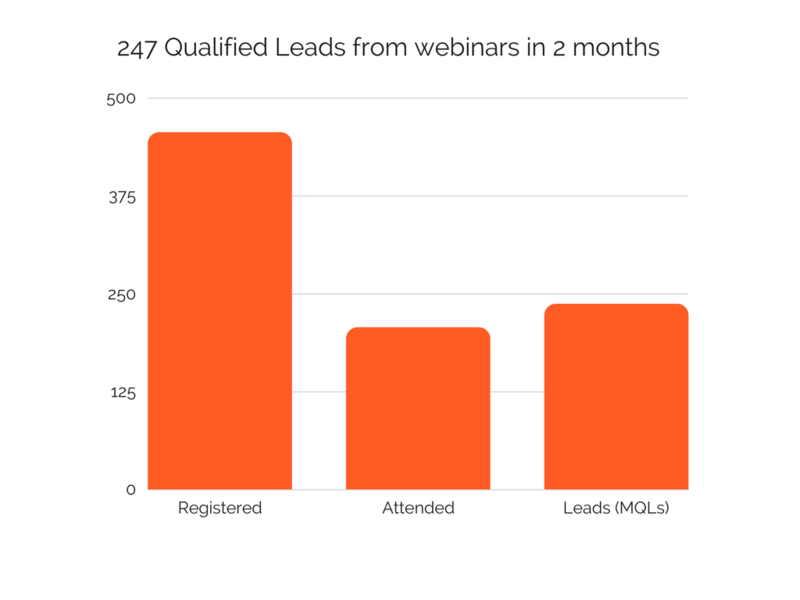 247 qualified leads. 437 registrants. 8 weeks. 4 webinars. Why did I run a webinar program to solve Hubbub's lead generation issue? I had already established an engaged community via a regular blog, newsletter and social media. However, it was not particularly easy for Business Development to identify those further down the buying cycle or to coldly contact them. With an already engaged audience and the educational nature of webinars, it seemed like an ideal channel to build closer relationships with Hubbub’s target audience. 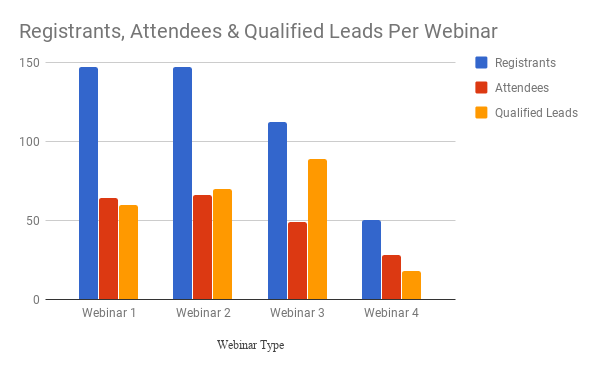 I decided to test the waters with a carefully planned webinar targeting 150 registrants and would run a further 3 webinars that quarter if the process worked. How did I plan for a successful webinar program? I’m going to focus on the first webinar specifically as the following 3 had similar processes. Given the goal was a lead generation one, it was important to understand the needs of Business Development and Sales. I organized a kickoff meeting and we agreed (via a written doc) the precise definition of an ideal lead. We established how many registrants were needed to reach the company pipeline target. We agreed on some pre-webinar registration questions to understand registrants' pain points and make life easier for the sales team during their post-webinar follow-ups. How did I pick a topic for the webinar? Hubbub’s CEO had published a guide ‘How to Run a Major Crowdfunding Campaign’ which was gaining daily downloads. It was clearly a topic Hubbub's target audience cared about so a webinar on the same topic seemed a safe bet. Howard Lake (publisher of fundraising.co.uk) has a big following in the charity space so we got him onboard to ‘host’ the webinar. Note: I iterated on topic selection for future webinars; specifically picking narrower, product-related topics for those further down the buying cycle. How did I promote the webinars? - Hubbub has a popular guide on the same topic ‘How to Run a Major Crowdfunding Campaign’ so I emailed an invite to those who had already downloaded the guide. - Created an auto-email invite sent to any new people that downloaded the guide (since it was organically getting daily downloads). -Created a pop-up linking to the guide on the Hubbub blog. -Utilized the audience of our webinar host. Howard promoted the webinar across the feeds of his large Fundraising UK audience. - Asked ‘influencers’ to share the webinar across their social channels. - Added onto the Hubbub website nav bar a pop-up about the webinar. - Created a webinar landing page. - Emailed the 1400 members of the Hubbub newsletter. - Posted in relevant LinkedIn groups and mailing lists where the target audience ‘hang’. -Posted onto Hubbubs's company Twitter, LinkedIn and Facebook pages. The areas above were the main channels used and from there it spread organically. How did I run the webinars? - Using GoToWebinar software (which integrates with HubSpot, the CRM used by Hubbub). - Booked a quiet room. - Ran practice tech test runs. - Used a separate Trello board purely for ‘logistical’ tasks. - Printed clear on-the-day instructions for both speakers. What did you do after the webinar? - Uploaded a video of the webinar to Hubbub’s YouTube channel and Hubbub’s website. - Emailed it to all webinar attendees within 24 hours of the webinar. - Created 6 different segments (e.g depending if someone was a lead, had attended, or not attended etc). Each segment received different email copy. The business development team then personally contacted leads. How did I ensure processes were in place for scaling? Since the webinar experiment was so successful, I wanted to replicate more webinars, as quickly as possible. I had documented all the tasks and placed them into a template Trello board so it was easy to repeat the process agilely. The process changed and improved after each webinar. For example, the first webinar drove lots of traffic but not necessarily from people far down the buying cycle. The topic of the third webinar, ‘How to run a crowdfunding program’, had fewer attendees but attracted those who were further down the buying cycle. If you have any questions about how I can help you run a lead-generating webinar for your B2B startup, get in touch for a chat!